The Romanian economy is growing strongly, unemployment has fallen to a record low, and the financial sector is improving. But without policy changes, growth will turn increasingly fragile, according to an IMF press release. For one, inflation could increase further, with possible social implications. A combination of fiscal moderation and monetary tightening would be the best course of action. Monetary tightening alone would have to push interest rates to a level that weighs on investment and competitiveness. 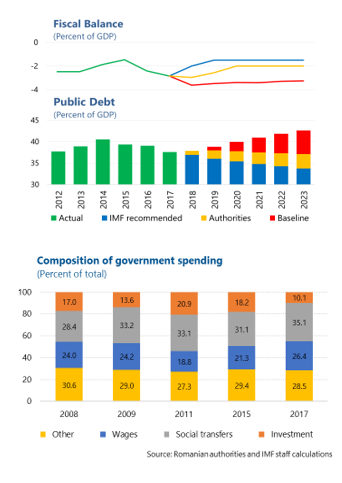 Continuing sizable fiscal deficits, especially with low investment spending, would also reduce the space to support the economy in future downturns and weaken Romania’s growth potential. Sustaining an inclusive convergence toward advanced European Union (EU) countries’ living standards calls for a predictable policy framework with medium-term orientation, supported by an efficient government and strong governance. The best time to act on all these fronts is now, with monetary and fiscal policies acting in unison. Economic growth surged to 7 percent in 2017—the highest in the EU. The strong growth has been fuelled by domestic consumption, on the back of a multi-year fiscal expansion and minimum wage hikes. An accommodative monetary policy stance and improving EU economy also helped. The current account deficit widened, as expanding imports offset the improving demand for Romania’s exports. A tight labor market is seeing private sector wages growing at double-digit rates. The target of the National Bank of Romania (NBR) was met in 2017, but inflation rose to 4.7 percent in February. Growth is expected to decelerate from last year’s high level due to multiple factors: a waning fiscal impulse, low public investment, slow progress on structural reforms, and tightening financial conditions. We project GDP growth to be about 5 percent in 2018 and to slow towards 3 percent over the medium term. Risks to this outlook are tilted to the downside. Global financial volatility, further deterioration in fiscal and external balances, or weakening of institutions could dent investor confidence in Romania. The continuation of current expansionary policies would undermine the country’s capacity to withstand a severe shock. A prudent mix of fiscal consolidation and monetary tightening would avert overheating, while reducing the fiscal and external deficits, and enhancing macro-financial stability. Monetary policy needs further tightening to rein in inflation and anchor expectations, given the pressure from global energy prices, strong domestic demand, a tight labor market, and recent currency dynamics. The recent monetary tightening was a welcome start, and we encourage the NBR to continue raising the policy rate, while also managing liquidity to align the market and policy rates. A more conservative fiscal stance would reduce the burden on monetary policy and help improve the balance between consumption and investment. If this task is left to monetary policy alone, interest rates would have to be raised to such a level that will increasingly weigh on investment and competitiveness. A smaller fiscal deficit is warranted, given the strong cyclical upswing. Large deficits during economic booms tend to cause domestic and external imbalances, result in excessive debt accumulation, and force a stronger (and pro-cyclical) adjustment during a downturn. The deficit should be reduced below a cyclically neutral level in the short run and further to 1.5 percent of GDP by 2020, contributing to a smooth return to Romania’s medium-term budgetary objective (MTO) under its EU commitments. Relative to current policies, we estimate that measures amounting to 0.6 percent of GDP—which should be of high quality—are needed to meet the government’s 3 percent of GDP deficit target for 2018, even as a smaller deficit target would be desirable. These measures should avoid a further deterioration of the budget structure and protect capital spending. Efficient delivery of government services is indispensable for sustaining inclusive convergence towards EU living standards. Predictable and medium-term oriented policies facilitate structural reforms, investment and growth. These go hand in hand with a more rules-based governance, continuing the fight against corruption, and a more resilient financial sector. Improving revenue collection. There is significant scope to strengthen revenue collection in Romania. Tax changes need to be more predictable and less frequent, and further tax rate cuts should be avoided. A comprehensive review of the tax system should be conducted, given multiple changes to the tax system in recent years. Tax collection efficiency could be improved, including by rationalizing exemptions and reforming tax administration, especially for the value-added tax (VAT). Implementing and operationalizing new IT infrastructure in revenue administration is a key priority, given Romania’s outdated and fragile systems. Increasing expenditure efficiency. Prioritization of large investment projects should be enforced and reflected in annual budgets. Expenditure reviews for key sectors could identify efficiency gains, and adopting a centralized procurement system could generate savings on goods and services spending. We welcome the plans by the Ministry of Finance to make progress in these areas. Enhancing absorption of EU funds. Effective absorption of EU funds, especially for large investment projects, would help address Romania’s big infrastructure gap, while also creating space for other essential spending. Improved management, especially at line ministries, is essential to ensure a high absorption rate, with funds applied to priority areas. A smooth transition to the next EU funds programming period calls for a timely preparation of new projects consistent with the EU requirements. Efforts by the Ministry of EU funds and Ministry of Finance to facilitate a faster EU funds absorption and reduce administrative burdens are encouraging. Enforcing the fiscal responsibility law (FRL). Romania has a sound FRL but its fiscal rules have not been observed. Better enforcement would increase fiscal discipline and predictability, and could start by better integrating the Fiscal Council’s work into the budget process. Stronger revenue mobilization and expenditure management through above-mentioned recommendations would also make it easier to plan ahead and abide by the FRL. 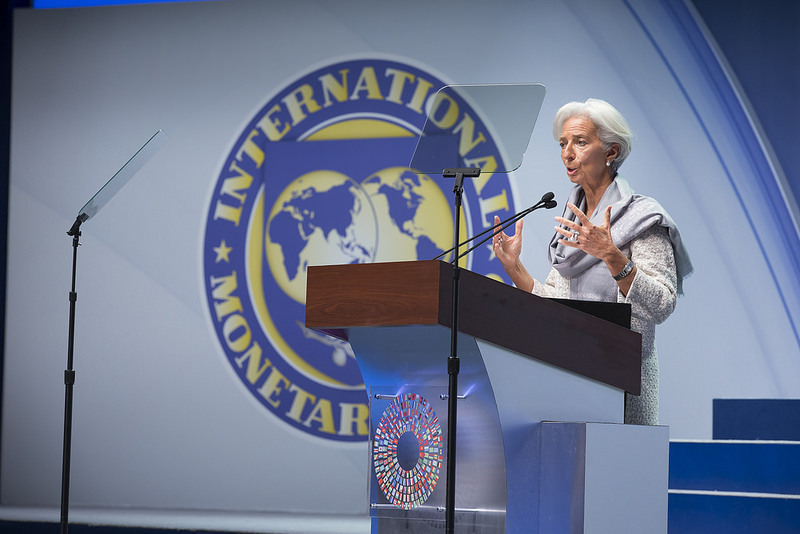 Structural reforms should be re-energized to alleviate constraints on growth. 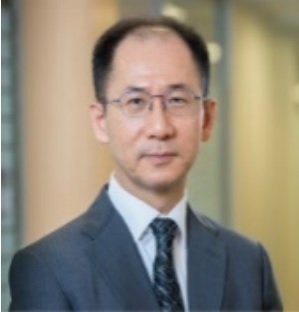 Improving service and financial performance of many state-owned enterprises (SOEs) requires a renewed commitment to strong corporate governance. In this context, Law 111 should be preserved, and any weakening of the existing corporate governance legislation should be avoided, while restructuring and privatization of SOEs should resume. 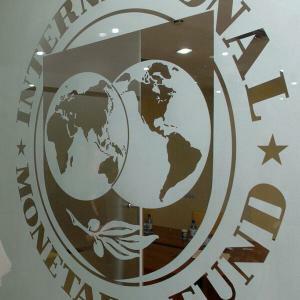 The government plans to establish a sovereign investment fund and a development bank should reflect international experience on the risks associated with such entities, and their design would need to be based on best practices, including on governance, reporting, and management of fiscal risks. Romania’s progress on the fight against corruption has been recognized internationally, and needs to continue. Reducing corruption would help improve government revenue, enhance spending efficiency, and strengthen competitiveness. Judicial independence and the rule of law should be upheld as the cornerstones of the fight against corruption and a rules-based governance. A Debt-Service-to-Income (DSTI) limit on mortgage lending would mitigate risks from the exposure of banks to the real estate sector. The proposed DSTI limit can boost borrowers’ resilience and should be imposed on all mortgages, including those made under the Prima Casa program. The government’s strategy to gradually scale back the program is welcome. Carefully calibrated capital surcharges could increase resilience against potential losses from sovereign exposures. The Romanian banking system is vulnerable to valuation losses in the event of sharp increases in interest rates. Capital surcharges—preferably the Systemic Risk Buffer—should be calibrated carefully to increase the resilience of the system while avoiding unintended market impacts. FX liquidity risks need a more proactive management. About 40 percent of banks’ liabilities and assets remain FX-denominated, and FX liquidity risks can exist within an environment of ample overall liquidity. Monitoring a currency-differenciated Net Stable Funding Ratio and imposing a currency differenciated Liquidity Coverage Ratio can help mitigate these risks. Continue bolstering supervisory practices and the crisis management framework. The processes supporting banks’ supervisory review should be further developed, and the framework for Emergency Liquidity Assistance be finalized and implemented. The central bank should establish liquidity facilities for the Bank Deposit Guarantee Fund. Finally, a stronger supervision of non-bank financial lenders would reduce regulatory arbitrage, mitigate credit risks and ward off reputational risk to the financial system. Legislative initiatives that harm the financial system should be avoided. Several recent initiatives would, if enacted, reduce the amount of credit provided to the real economy and slow the resolution of NPLs, thereby adversely affecting financial stability. These include the proposals for capping interest rates for household lending and the prices at which individuals re-purchase debts acquired by third parties. An IMF staff team visited Bucharest during March 6-16 to conduct the 2018 Article IV consultation discussions. The team is grateful to the authorities and other counterparts for their warm hospitality and constructive dialogue.